Be prepared for spectacular views of a river flowing – down in a narrow canyon. There is so much to see and do in Colorado and easy to bypass this park -Don’t! Do turn off the highway and come explore, both the North and South Rim. 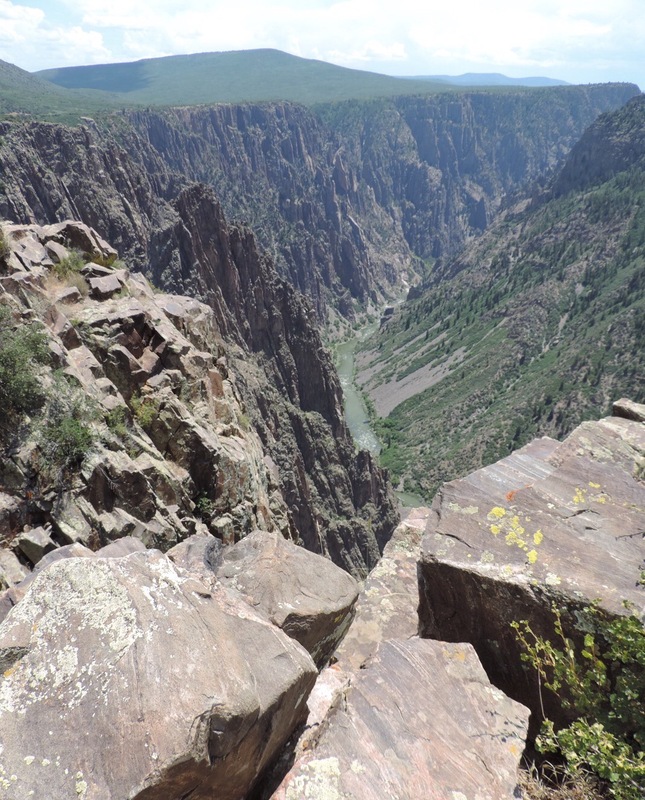 Before I arrived at the South Rim Visitor Center I had stopped at the Curecanti National Recreation Area, just east on US 50, and picked up a Junior Ranger Activity Book for Black Canyon of the Gunnison NP. I completed the booklet by driving the road along the rim and stopping at several overlooks. 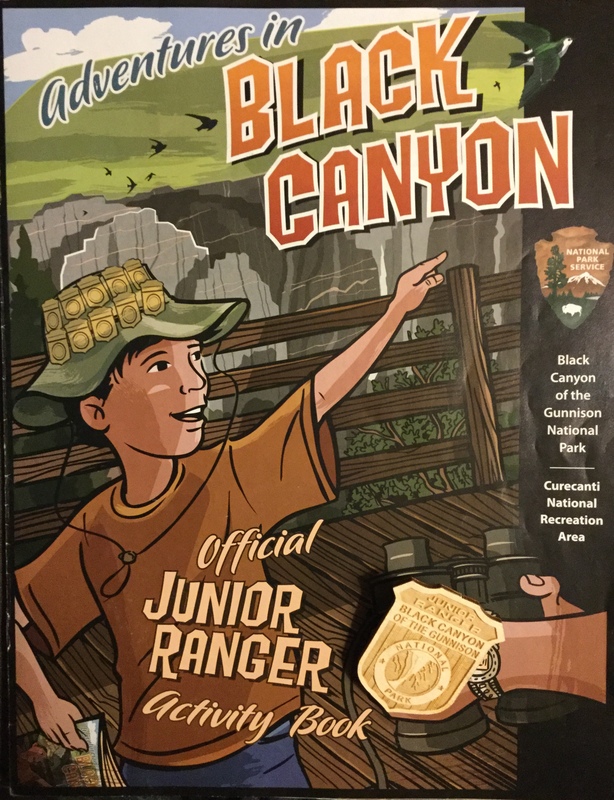 When I turned in the completed booklet I learned I had been given the booklet for the youngest crowd (designed for ages 4 – 6), however the staff awarded me the Junior Ranger badge. On my next visit I’ll complete the more advanced program. The booklet I completed had five activities, and four had to be completed to earn the badge. The activities are; Draw the Black Canyon!, Are you my Mother?, Explore the Wild Inner Canyon!, Who lives Here? and Tic-Tac-Toe! 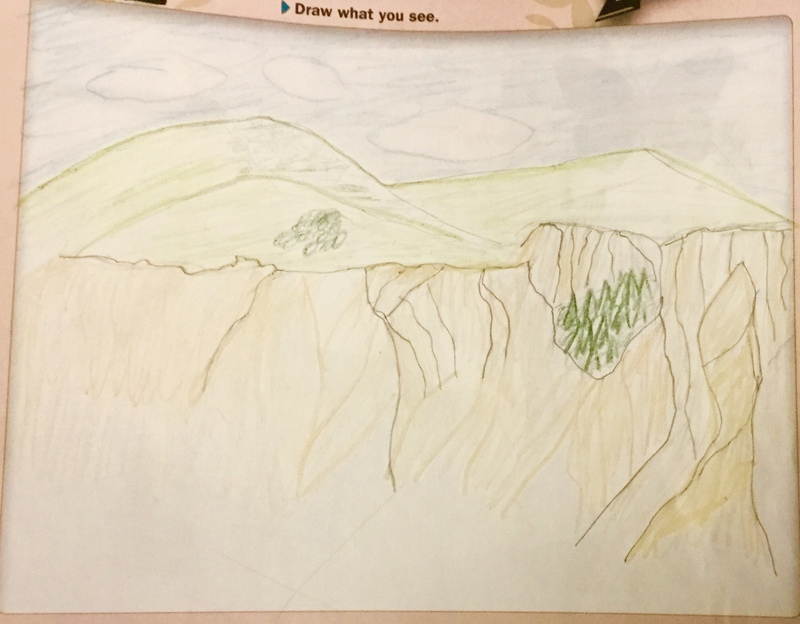 As with other basic Junior Ranger programs I enjoyed this booklet, especially taking time to work on Draw the Black Canyon. Are you my Mother? had you match a picture of the young with an adult animal, like a caterpillar with a butterfly. The nine squares for Tic-Tac-Toe were fairly easy to complete three in a row, some of the activities that I completed were; having a picnic, spot a soaring bird, visit two overlooks, smell a sagebrush and take a picture, as well as other activities. Ranger Amy was enthusiastic in reviewing my booklet, signing the certificate on the back of the booklet and issuing my enhance wooden Junior Ranger badge. The badge depicts steep canyon walls and the Gunnison River. Less than an hour from Colorado Springs, along US 24, you will see amazing fossils in a beautiful setting. I love visiting this site and for the first time completed their Junior Ranger program during this last visit. Their collection of plant and animal fossils is amazing, both inside and outside. The hiking trails range from very short to longer through pine forests and open meadows at 8,100 feet elevation. During the summer, afternoon mountain thunderstorms will move in and the trails are closed for your safety. This program is considered Senior Friendly as the upper age group is not set. The groupings and number of activities to complete are; 4-7 years – 3 pages, 8-10 years – 5 pages and 11 years and older – 7 pages. With 13 different activities, at a variety of skill levels, there are plenty of activities of interest for all of the age groups. Activities include; Dot to Dot, Map Maker, BINGO!, Leaf Detective, Learning the Layers, Fly Maze, Email Friends, Be a Paleontologist, Influential Women, From the Ute Perspective, Take A Hike, No Ordinary Homesteader, and Pick Your Next Adventure! I enjoyed their BINGO format, 16 squares, with a short description of what to look for and space to draw what you saw, answer a question about the item or complete an activity. Questions were about the color of lichen, bark, type of fossil, and an animal home. Activities were hiking, attending a ranger program, having a picnic and visiting a historic site. Leaf Detective had you sketching a modern leaf and a fossil leaf from their collection in the visitor center and answering some questions about each one. A couple of the activities, Learning the Layers and Be A Paleontologist, were based on displays in the visitor center. The display area is small, but packed with excellent information. Sometimes too much information is given and it is hard to stay focused, these displays are just right! A word search activity, Influential Women, provided great information about local women, as well as professional female paleontologists who strongly influenced this area. I appreciated that facts about the women were given and key words from the facts were used in the word search. Behind the visitor center is a covered area with big fossilized tree stumps and picnic tables. After completing the hike and gathering information needed for his booklet I enjoyed sitting outside to put the finishing touches on this program. Once I did compete the booklet I took it back inside for a ranger to check it over. After that I was administered their Junior Ranger pledge and given the standard badge.